Most fetuses develop the ability to hear around the 5th month of pregnancy when they start to become aware of stimuli outside the womb. Many believe that in utero exposure to music (especially the classical variety) results in enhanced intellectual development. Although on its own music is unlikely to turn your baby into a genius overnight, exposing your baby to different types of music is a fantastic way to teach them about the world while developing your baby’s emotional, linguistic and motor skills in a non-pressurized, enjoyable way. Research findings, such as those that, suggest newborn babies recognize music played to them in the womb and that fetuses move and breath in time with music they enjoy, have been taken as evidence for an ‘increased level of cognitive development’ resulting from in utero exposure to music. For those mom’s-to-be who are active, multi-taskers who don’t have a lot of time to put their feet up bellybuds™ bellyphones™ audio system may be the solution for you. 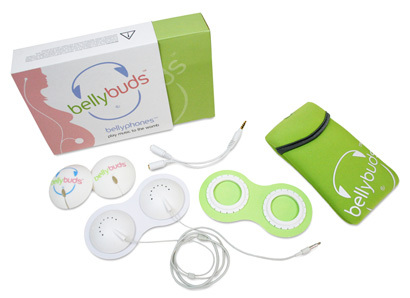 Bellybuds are wearable speakers designed for moms-to-be that desire to play music and sounds, conveniently and safely, to a developing child in the womb. Audio in utero on the go! They are specially designed to adhere gently to the varying curvature of a pregnant belly. Whether worn discreetly beneath clothing or in full view bellybuds are a convenient and effective option for playing audio to the womb. Some of the things I really like about bellybuds are that they plug into any standard digital music device which is awesome and convenient. Also, by using the audio splitter (included in the deluxe package) I was able to adjust the volume effectively, and enjoy the music while my fetus was also listening – it was a great way to interact and bond with my baby whilst helping their development. My husband and I come from different cultural backgrounds, by using bellybuds with my MP3 player I was able to play a variety of music to my baby from classical, and jazz to our own cultural specific music. I found that when playing children’s music, the baby seemed to react more by moving around and kicking. *Adult headphones and mp3 player not included. Sam and Charlie Enjoy Seaworld With Their Aunt Josefin!